Trevor St. John grew up in Orchard Prairie, Wash., and attended Whitworth College in Spokane on a jazz scholarship. That was where where he got his first taste of acting. Hollywood came to Spokane to shoot the film Benny & Joon, and St. John was hired as Aidan Quinn’s stand-in. After his 1993 graduation, St. John headed for Los Angeles. His first film role was playing a skinhead in John Singleton's Higher Learning. Things did get "higher" from there, because he landed roles like that of Glenn Close’s son in Serving in Silence and Kris Kristofferson's son in Payback alongside Mel Gibson. 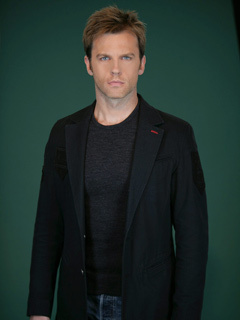 St. John also guest-starred on several television series and had just finished an off-Broadway play when ONE LIFE TO LIVE came knocking. He was hired to play a new character, Walker Laurence, but soon discovered (like the audience) that Walker was the nefarious and troubled Todd Manning in disguise. Now a New Yorker, St. John enjoys sports (but not the Yankees!) and practicing Buddhist meditation. His official Web site is www.trevorstjohn.com. He played jazz percussion with the Count Basie Orchestra and the Duke Ellington Orchestra. He owns Bioconstructs, a company that teaches biomechanics to fitness professionals. He's a Seattle Mariners fan. St. John considered being a physical therapist before he got into acting. He tried out for the role of Kevin Buchanan on OLTL. ONE LIFE TO LIVE Reunion Pics! Michael Easton (Finn, GH; ex-John, ONE LIFE TO LIVE et al) has released a trailer for his film First Strike Butcher Knife, which stars his former OLTL castmates Trevor St. John, Kamar de los Reyes and Sherri Saum (ex-Victor, ex-Antonio and ex-Keri). To view the trailer, click here. Rick Hearst (most recently GH's Ric), Chrishell Stause (Jordan, DAYS), Bryan Craig (Morgan, GH) and Trevor St. John (ex-Victor, OLTL) have joined the cast of the teen-centric web soap YOUTHFUL DAZE, which just began its third season. Trevor St. John (ex-Victor, OLTL) just shot an episode of Lifetime's new series THE CLIENT LIST, which stars Jennifer Love Hewitt. Sources tell Digest that Trevor St. John's (Todd) final day on set was today and that the actor bid farewell to the OLTL cast and crew by treating everyone with a full day of yummy craft services treats. ONE LIFE TO LIVE's Trevor St. John (Todd) has announced on his Web site that his last shooting day will "likely come the week of July 18th." Roger Howarth Returns This Week! At last! The tale of two Todds kicks off this week when Roger Howarth, who originated the role of Todd Manning in 1992, finally returns to Llanview on Friday, May 13 (scar and all).